Ages ago, I bought a load of disposable syringes and needles for use with epoxy glue (this was when I was sticking solar cells to the edges of acrylic sheets in my PhD project). 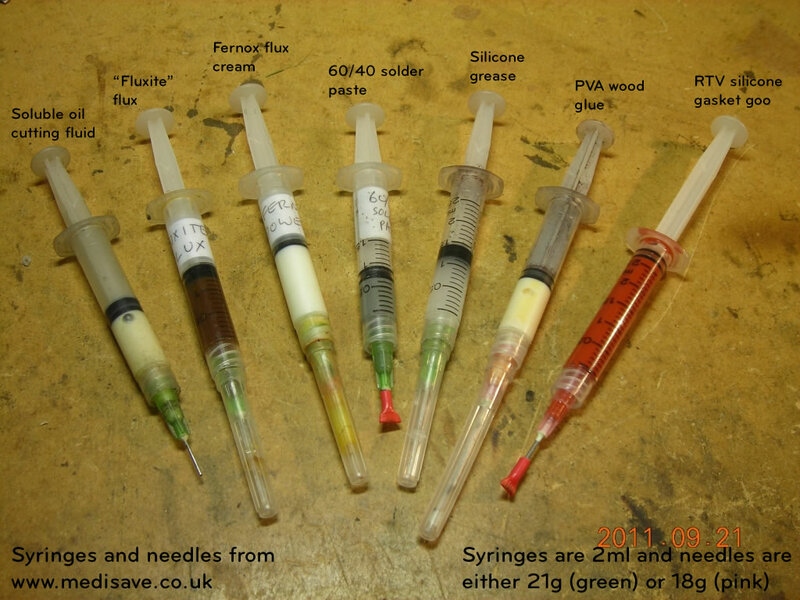 Over the years, I discovered how useful syringes are for dispensing material, and I thought I'd show some examples of what I use them for. The syringes and needles were bought from Medisave (look under their "Needles & Syringes" section). Get the Luer Lock syringes, rather than Luer Slip - with Luer Lock, the needle screws on to the syringe tip and is held much more securely. I got 21g and 18g needles which are pretty good for most purposes. I couldn't see any blunt needles (they are available - check for "mixing needles" or "drawing up needles"), so I just got sharp ones and sanded them down. Blunt the tip first so there's no danger of stabbing your finger in the process. They are extremely cheap as well - I think something like £25 got me 100 syringes and 100 each of the different needles. A good tip protector can be made from a short piece of cable insulation, melted and squashed at one end to make it airtight (these are the little red things in the photo).